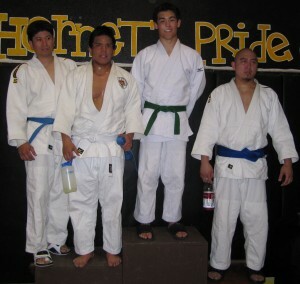 The Bay Isle Judo Tournament was held on Sunday, April 18, 2010 at Alameda High School. Seven members of EBJI competed and represented our dojo at the event. Romeo Lok, 8, went 1-3 and finished fourth out of five. After losing his first match, he went out in his second match, fought pretty hard and won by osoto gaeshi. Although he lost his third and fourth match, Romeo has shown improvement and seems to enjoy competing. Nathan Canadas, 11, went 2-2 and finished fourth out of seven. He won his first match with a sasae tsuri komi ashi followed by kesagatame, and his second with osoto gari for ippon. He lost his third match by ippon, by drop knee seoinage, and his fourth by ippon, via kosoto gari. He fought very hard and ended up losing to the top two players in his pool. Nathan showed good effort and will hopefully attend more tournaments in the future. Dillon Izzo, 13, went 0-3 and had to withdraw from his last match. Although he lost, Dillon fought hard his first match and went to golden score, where he got thrown for ippon. Dillon lost his second to a considerably bigger opponent, who caught him with an osoto gari for ippon from a high right grip. He lost his third match but fought hard – after being thrown with ouchi gaeshi and getting pinned, he managed to escape, but he couldn’t get the score back, and he tweaked his ribs in the escape. Ociane Canadas, 13, went 0-2 and finished third out of three, although she fought hard. She lost her first match by ippon, by left side uchi mata, and her second match by ippon seoinage. Ociane, who is pretty agile, needs more tournament experience to improve her competition judo. Bob Cunliffe, who works out in the T/Th Adult class, went 1-2 and finished second out of two. He lost the first match by non-combativity, won the second with a yuko via a footsweep, and lost the third match by non-combativity. To Bob’s credit, he fought hard and well against a much younger opponent. Jared Beane went 4-0 and took first in his division. He won his first match by ne-waza, and the rest by tachi waza – all ippons. John Bennett went 3-1 and won first. He won his first match with shime waza, his second by ippon with osotogari. He lost his third via shimewaza, after dominating the match throughout. They met again, to break a three-way tie, and John tossed him for ippon with a nice seoinage off the grip.